LIS staff art show featured in this new blog here. This entry was posted in Uncategorized and tagged Areas and Workgroups, Art, art exhibit, blog, exhibit, midd, summer on June 20, 2010 by Elin Waagen. Mark your calendars for the EXHIBITED! opening reception on Wednesday June 10th at 4pm! Please note new dates of the exhibit and the opening. This entry was posted in LIS Staff Interest and tagged Art, craft, EXH!BITED, exhibit, June 5 2009, lis staff on June 5, 2009 by Elin Waagen. Calling all LIS staff artists! 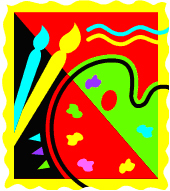 The LIS Staff Arts and Crafts exhibit has been scheduled in the Main Library Atrium for June 8 – 22. Submissions are trickling in – please let me know as soon as possible if you would be interested in displaying your work. This entry was posted in LIS Staff Interest and tagged Art, crafts, EXH!BITED, exhibit, lis staff, May 8 2009 on May 8, 2009 by Elin Waagen. Do you have any artistic and creative pursuits you would be interested in exhibiting? So far LIS staff artists and crafters have expressed interest in exhibiting photography, painting, quilting, lacework, knitting, and other fiber arts. Are you a potter, painter, sculptor, knitter, calligrapher or weaver? Please consider sharing your work with others in LIS and across campus. Contact Elin Waagen if you are interested. This entry was posted in LIS Staff Interest and tagged arts, crafts, EXH!BITED, exhibit, Feb 27 09 on March 2, 2009 by Elin Waagen. Are you an artist or craftsperson? I am trying to gauge interest in an LIS staff arts and crafts exhibit in the main Library at the end of March. This entry was posted in LIS Staff Interest and tagged Art, crafts, EXH!BITED, exhibit, Feb 20 09 on February 23, 2009 by Elin Waagen. Calling all LIS artists and crafters! Would you be interested in exhibiting one of your artistic works in the Main Library in late March? If so, please contact Elin Waagen. This entry was posted in LIS Staff Interest and tagged Art, crafts, EXH!BITED, exhibit, Feb 6 09 on February 6, 2009 by Elin Waagen.